The SharePoint module in Decisions allows you to update and add SharePoint list's as well as SharePoint document data using steps in a flow. Before using these steps, the SharePoint Module must first be installed in Decisions. Creating SharePoint lists and or Documents have all the same features, the only difference with creating SharePoint documents, is that you can add file data. 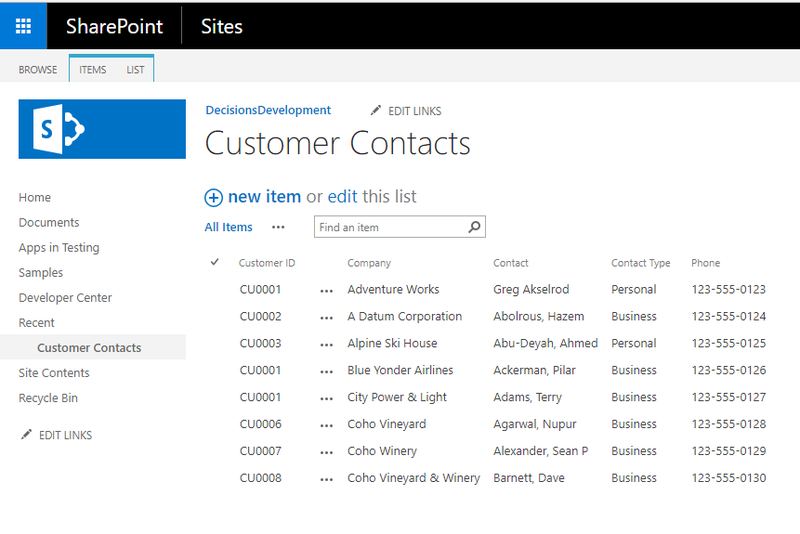 In this example, a custom list created in SharePoint named Customer Contacts has been created for the example. 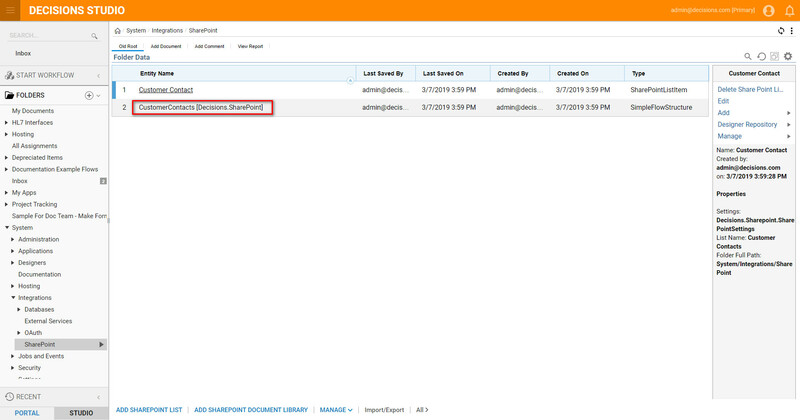 Before we can interact with our SharePoint list in a flow, we need to set up integration with the list. This is the SharePoint integrations folder, where all of our list integrations and SharePoint defined data structures will be stored. 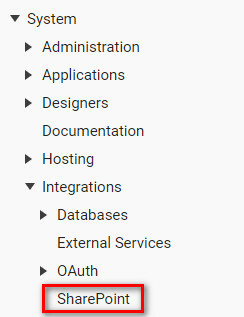 Begin by navigating to Security> Settings> Integrations> Sharepoint located in Decisions designer Folders. 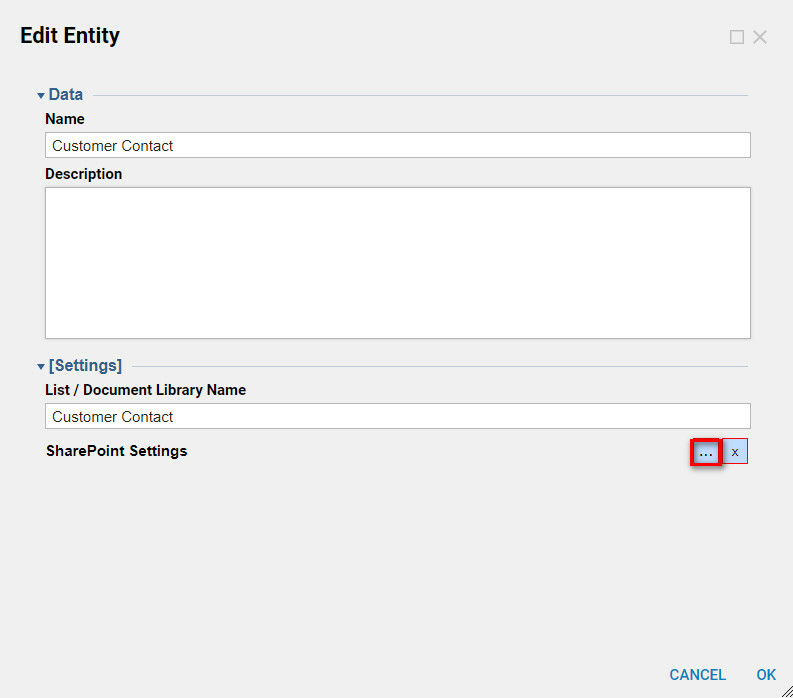 Here the option to Add SharePoint List or Add SharePoint Document Library is available on the blue action bar. Select Add Sharepoint List. Here create a list in Decisions and in the settings section and in List/Document Library Name. Select the edit action outlined in red to configure SharePoint list. 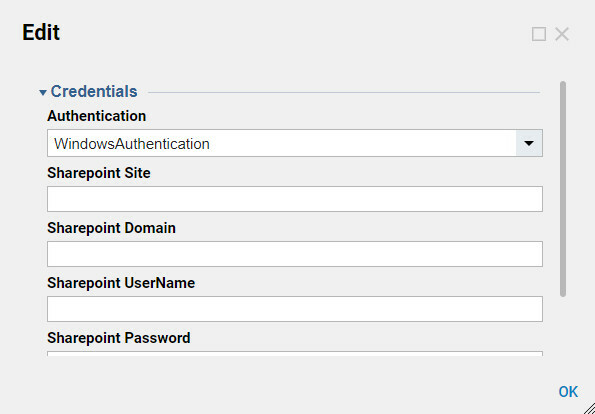 Configure the SharePoint settings : Sharepoint Credentials. The list below describes what the authentication credentials are. Complete the credentials settings and set up SharePoint integration. A description is provided for each setting. The settings can involve specific detail and need to be accurate for the lists connect. Authentication: There are 4 options for SharePoint authentication: Windows auth, SharePoint Online auth, claims auth with SiteMinder, and federated claims auth with SAML. Sharepoint Site: The SharePoint site URL, likely either "https://<your_domain_here>.sharepoint.com" or a self-hosted URL. SAML Site:* If using SiteMinder, this is the SiteMinder URL. Sharepoint UserName: The username portion of the user identifier, appearing before the '@'. For federated claims auth with SAML, this is the entire user identifier, instead. **Sharepoint Password: **The password for this user. Specify Sharepoint Server: This setting affects only the user identifier used to authenticate, providing an alternative to 'onmicrosoft.com' email addresses. If checked, 'Sharepoint Domain' will be replaced by 'Sharepoint Server'. Sharepoint Server: If the username is 'myUser' and the value of this field is 'example.com', the user identifier ultimately used to authenticate will be 'myUser@example.com'. After saving the list information the configuration data and a Decisions defined data structure are auto generated in the folder. After the configuration can be seen in the folder, SharePoint is now set up in Decisions. Now create a Flow to use the SharePoint Steps. See related articles.